Except for the World’s Fair in 1962, Lesser Seattle in all its short-sightedness has dominated the city’s vision, or lack thereof, when it comes to the big ideas. If the proposed Sonics arena falls victim to the usual 15-minutes-of-fame Sports naysayers, the handwringers who just can’t help themselves and the often politically motivated chest-thumpers, it will be a crying shame. Recall lasting legacies such as the Forward Thrust infra-structure fulfillment, The Commons, the tussle over the viaduct (a near miss) and myriad other missed opportunities to turn this fair city into a World Class one. We have an opportunity to do that now, as well as righting a woeful wrong, by restoring the NBA to Seattle, adding an NHL team and building an entertainment venue that will attract top performers to a setting in which we all can actually enjoy seeing them. To all the sports haters, you don’t have to be a part of it or even have a whit of interest in sports to benefit from them. It’s time to elevate Seattle to its rightful stature. Much has been said about the gift-horse status of this opportunity. Much more has been said about the value of the community sports teams create; the way they cross economic and social barriers, provide role models for at-risk youth and inspire participation all around. That’s also a good thing. The legitimate concerns about traffic and impact on the Port are manageable – after all, we have some of the best and brightest minds in the country residing here because of the quality of life the area offers. A solution is waiting; actually one existed and would have made this a non-issue, but the city diverted the dollars to the Mercer Street reconfiguration. In other words, the city needed to fix the SoDo problem anyway. But bottom line, major sports teams draw people (residents and out-of-towners) and businesses to the cities that support them. And while they are here, they spend money: taxable dollars that support, sustain and extend other important quality-of-life features as well as contribute to the creation of more businesses and jobs. Not just a few but many jobs that begin with construction and grow into service worker employments and entry-level jobs for teens, as well as small-business development, and end with team personnel and related satellite employment and all their commerce and consumer contributions. The benefits are far-reaching and multi-layered; they trickle down…and up! It’s time to step up to a Greater Seattle! If Seattle won’t, Bellevue might. Stepping off the soapbox and back into the media and marketing world: right or wrong, the existence of the full complement of sports teams has long been one of many factors in choosing a market for a media buy, a product introduction or an expansion location. Sports teams also attract tourism and tourism puts Seattle on the map and top-of-mind. But the Seattle-Tacoma DMA – essentially Western Washington – only ranks 13th in the nation for population. That obviously leaves it out of the Top-10 buys…until the other factors are taken into consideration. A full roster of professional sports teams indicates market vibrancy and market vibrancy equates to higher-quality audiences. Being a high-tech haven and having a high quality of life helps bring some of those dollars to market, but Seattle gets looked over for many more. As noted in a previous post about the Seattle Mariners, Seattle sports enthusiasts have long enjoyed recognition as being some of the most loyal fans in the nation. When the Sonics were snatched from the market, an average of nearly 260,000 in-market adults were attending games over the season. That doesn’t include any family members attending under the age of 18 who tagged along. Another 340,000 were watching or listening to regular season NBA games, presumably a good portion being Sonics home and away games. 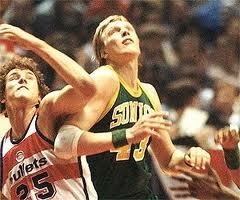 Back in the day, my mother never missed a Sonics game on the tube. And if I made the mistake of calling during a game I was brusquely informed to call back later. She considered the team “her boys;” I heard so much about Paul, Jack, Shawn, Gary and Detlef over the years, I actually began to think they were relations. She wasn’t an anomaly – I have since heard similar stories from other friends about parents who kept their blood flowing by watching the Sonics, even if they weren’t fans in their younger years. And the profile of avid Seattle NBA fans seems to bear that out; the sport draws considerably more from the ranks of the retired than do our other pro-sports teams. Even with the team playing in another town for the past four seasons, 154,000 in-market adults still claim they are “very interested” in the NBA and 62,000 say they are interested in buying NBA season tickets. Nearly 8,000 currently are making the trek to Portland to see the Trailblazers. And up to 6,000 showed up for a weekday rally to support the arena in June. Nearly 115,000 in-market adults consider themselves avid NHL hockey fans. Nearly 195,000 already follow NHL regular season games on TV or radio. More than 22,000 have traveled to a Vancouver Canucks game in the past year. And even more fascinating given Seattle’s never been home to an NHL team, more than 67,000 are interested in purchasing season tickets for an NHL hockey team. A lot of number-crunching took place when the arena idea first was broached, particularly around per-team available spectators in the metro area and personal income. The conclusion was that Seattle can’t support one, much more two more teams. That’s fine if all things are equal. A Midwest expert, basing his opinion on other cities (since when has Seattle been like any other city?) surmised that 70% of the attendees would come from within the city or county at the farthest. He failed to take into account those who travel from not only out of the metro area, but from across state to as far away as Alaska, across the border from Canada, from Idaho and, for football and baseball, from Oregon. They claim that the mostly weeknight NBA and NHL games wouldn’t attract the same crowds as the weekend games of the Seahawks. Yet, I share season tickets to the Mariners with a gentleman who travels from Idaho to see entire series whenever his favorite teams are in town – and there are a number of them, so it’s not unheard of. Our other seat partners regularly come down from Lyndon, on weeknights and ends. Only 10% attend UW basketball games, but that is a higher percentage than for either Mariners or Seahawks attendees. If any team has to worry, it is the Mariners as they have the highest cross-over of any team. Their concerns, while misdirected toward traffic and conflict scheduling of events, are legitimate, especially if they continue to let the team wallow. 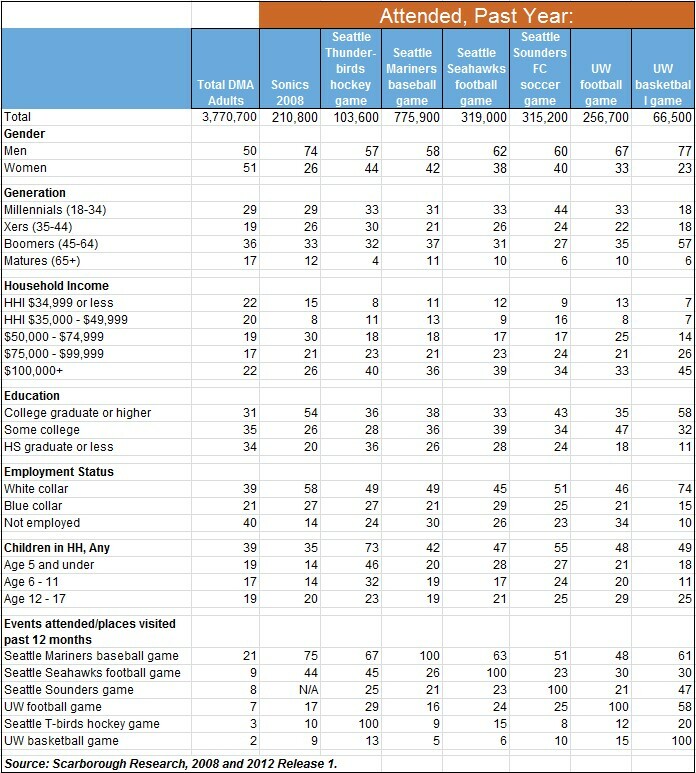 Back in the day (2008) 75% of the Sonics fans attended Mariners games, 44% attended Seahawks games, 17% attended UW football games and 9% attended UW basketball games. While the Seattle Thunderbirds aren’t NHL, 10% of Sonics fans also attended those games. As far as the two new franchises are concerned there is very little cross-over between the most passionate followers of the two sports. Only 4% who consider themselves very interested in the NBA or NHL hockey are very interested in both. And only 12% of those who are interested in purchasing season tickets to either sport are interested in purchasing for both franchises. So even if these teams attract a capacity crowd of season ticket holders, it leaves a lot of folks in the single-ticket line or on the horn with StubHub. I’m with the supporters on this one: passions and loyalties around sports teams repulse the numbers… and common sense. Their spirit overturns the observable world, along with any assumed behavior. How did that uptight suit turn into a face-painted maniac? Like sport itself, the unpredictable must be taken into account. 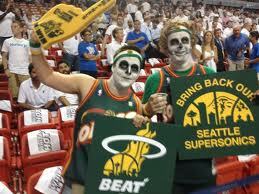 The Sonics arena is a good idea, a good deal, good for the community and good for business.